Projects at the Fairfield-Suisun Sewer District are hallmarked by transparency, open communications, and disappearance of the traditional silos that often plague the clean water profession. That’s in great part due to the efforts of Jordan Damerel, Director of Engineering. 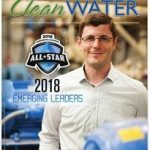 “Jordan manages the District’s Capital Improvement and Asset Management programs, and he’s constantly working towards more transparent planning processes which allow greater buy-in from O&M and engineering staff,” says Meg Herston, Environmental Compliance Engineer, who nominated him for an Emerging Leader award. 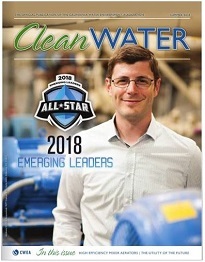 The number of noteworthy projects is many, and includes the Nereda nutrient removal pilot and the District’s public-private partnership with Lystek, a regional biosolids processing and re-use facility. Damerel also prepared the analysis justifying energy efficiency savings that allowed the District to be awarded $4 million in principal forgiveness from the EPA’s Green Project Reserve, reducing the District’s State Revolving Fund loan for its Blower Replacement Project from $11 million to $7 million. Damerel has been with the District for three years, with six years as a consultant prior to that. He heads a six-person engineering department. He also teaches math and wastewater courses through Solano Community College and the Bay Area Consortium for Water and Wastewater Education (BACWWE), providing free classes and networking opportunities to students interested in the water industry, and through which many of the District’s staff and interns have been educated. His job excites him as well. “More than a specific project, my favorite work is what we do to bridge gaps between operations, maintenance, finance, and engineering—collaborating on running the plant better, improving efficiency, saving money and power, generating more renewables.